You either love them or you hate them, but since I have chickens there is a never-ending supply of fresh eggs around here and I'm always looking for new ways to use them. We love pickled eggs and in this month's Mother Earth News magazine there are some excellent recipes. They make a nice snack or addition to salads and they are quite healthy for you (especially when they are from free range chickens). 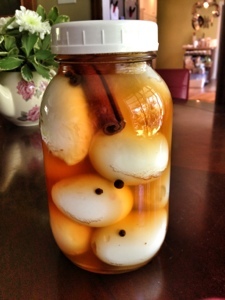 Did you know pickled eggs keep for up to a month in your fridge? I'm sure ours won't last that long.